Not all comfort food is full of carbs. 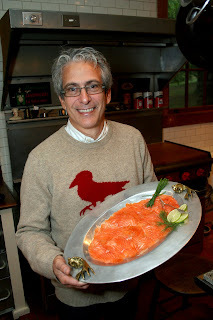 Some, like Chef Michael Somer's signature gravlax from the Rock Hall Bed & Breakfast in Connecticut's Litchfield Hills is almost good for you. Michael, a Wall Streeter-turned-chef, and his wife, Stella, designer of knitwear, interiors and fine jewelry, run the Addison Mizner-designed B & B. Place the salmon, skin side down, on a large sheet of plastic wrap and check for small bones. Drizzle cognac over the flesh. Combine salt, sugar, cracked black pepper and seeds in a small bowl and spread mixture evenly over fillet. Chop a large bunch of dill - stems and leaves - and coat the entire fillet with the chopped dill. Wrap the plastic wrap tightly around the salmon, weigh down with a brick and refrigerate 48 hours. Unwrap, rinse with cold water and slice on the diagonal; discard skin. Serve with soft goat cheese, creme fraiche or cream cheese along with lemon wedges, mustard sauce or a touch of good vinegar. Assemble and season to taste.